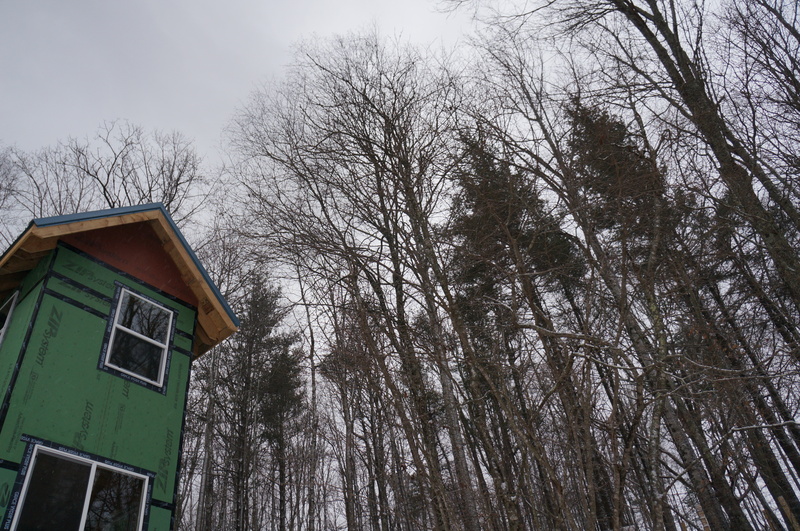 We’re one step closer to completing our master plan–building a mortgage-free micro-homestead. Our 1400 sq. ft. main house is dried in. You can do this, too! I’ve watched the big house grow out of the hill above the tiny house for over a year now. Slow and steady. 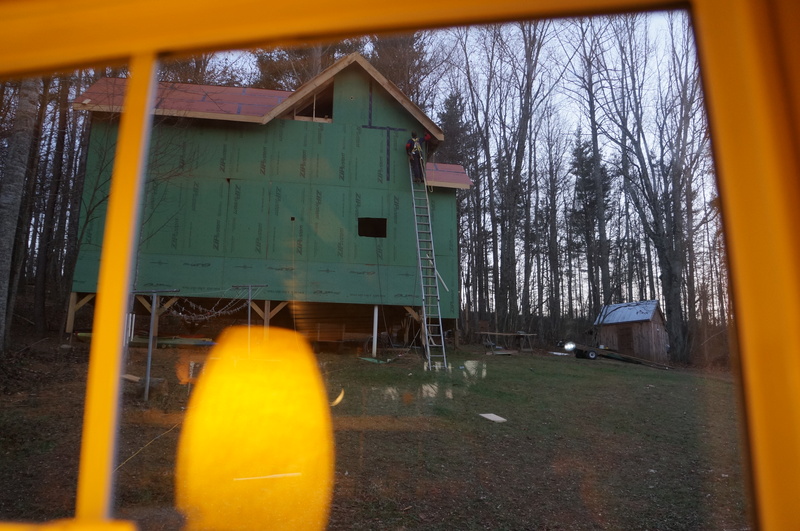 I help when it’s possible to help and have done my share of pushing my comfort level – operating a sawzall and picking up giant windows to send them through the hole to my husband standing on a 30 foot ladder top my list. I’ve had some fear watching the big house grow. First, it looked like an alien spaceship, a giant green blob on a stand. I thought, ugh, what have we designed? Of course, I can picture the house in it’s finished glory, but each stage is slow and I get to know the house uniquely in those stages. Once the roof went up, it looked massive. I wished we had made a lower pitch. We considered everything about the pitch except how difficult it would be to actually install the roof. There was even a week or two in there where we had no idea how we would get the roof on the house. We considered renting lifts, buying scaffolding, borrowing scaffolding, and hiring a crew. Then we decided it was impossible. We built a giant green hunting stand. It can be so discouraging to face things we don’t know how to do, especially when the answer isn’t easily found at our finger tips. 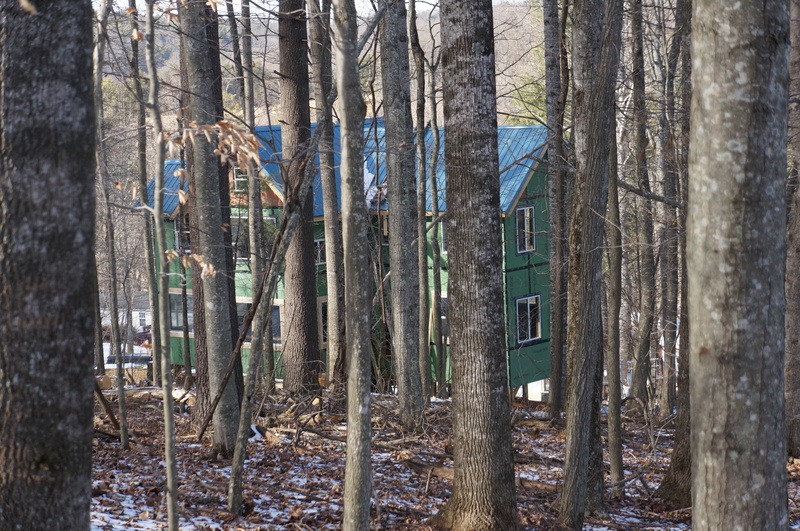 We couldn’t Google how the hell do you put a roof on an 11×12 pitch in the woods on a hill with only three ladders? Or is it really impossible to install the last rafter over your head when your ladder doesn’t go that high? Believe me, we tried. We found pieces of information, but the answers didn’t come from Google, they came from the moving–from the doing. We have to keep moving to find what we need. When we were stumped, Karl kept doing things he could do, like cut the block boards for the rafter vents and then an idea would come: I’ll install footholds. I’ll buy a walkboard. I’ll shove the metal up from the walk board. In the doing, the answers come. Eventually Karl installed toe boards to nail off the roof sheathing, then came up with the idea to clamp a long rope to the metal roofing. The rope went over the peak and down to the ground where I stood. Karl walked up the ladder pushing the metal sheet while I pulled the rope from the opposite side of the house to make sure the metal didn’t fall on him or get caught by the wind. 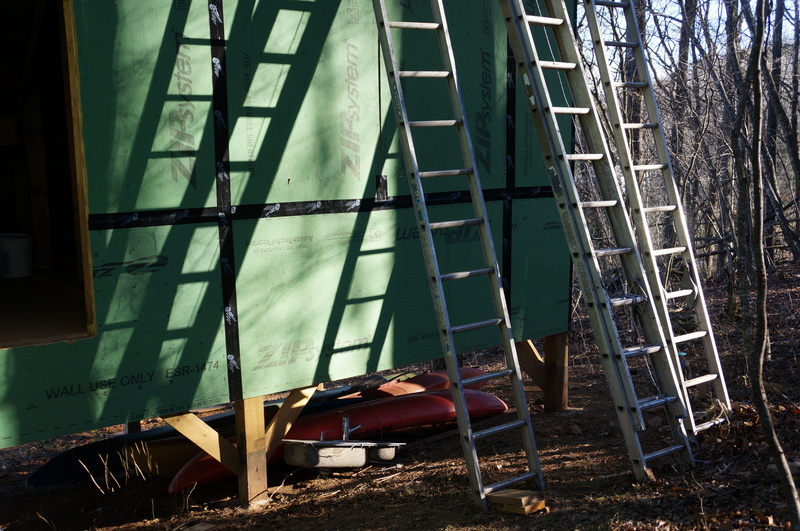 Once we got the metal sheet in place, he grasped a chicken ladder and screwed the sheet down. While he did this, I ran down to the tiny house to write some more on our eCourse and then he’d whistle for me when it was time for the next sheet. We maxed out at 4 sheets a day. The roof took a long time. Fear wrapped with uncertainty wrapped with a 30 ft. peak looking into a valley and yikes! It was easy to put it off. Oh, and we had a few ice and snow storms in there too. So you can imagine how thrilled we were to install windows. We were thrilled because it went fast. Fast fast fast. We installed about 5 windows at a time. The downstairs windows went quickly, the upstairs took a bit more time because we had to move ladders and secure them to the house, and move the safety harness–I had no idea how much time goes into moving ladders and harnesses. If our house was one level, we’d probably be finished with the exterior by now. I know we will be glad we built two-story when it comes to heating. 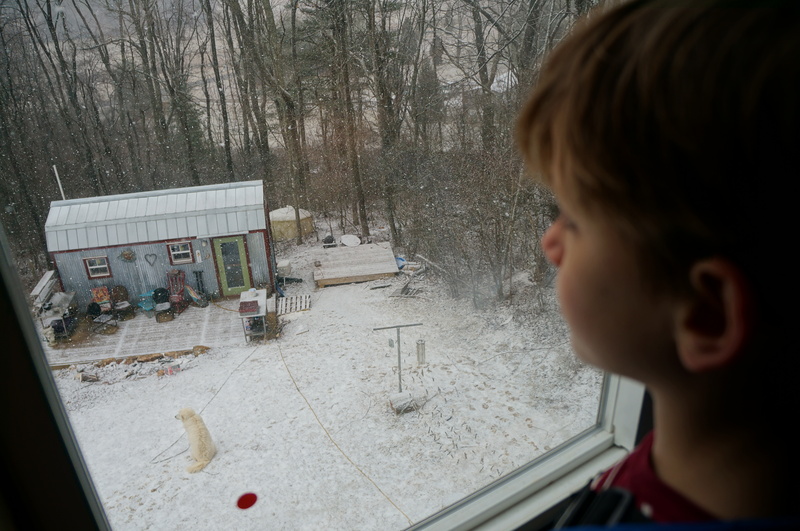 It’s also amazing to stand in the second story windows and take in the mountains around us. But, oh, the agony of figuring out the logistics. Working with Karl to accomplish this dream is life-giving. I see the spaces we poured over on paper in real-life 3D. I see the building start to take on its own character. What looked like an alien blob on a stand, then a giant house–too big and ugly for inhabiting, now looks majestic, inviting, creative and homey. I see what Ella will see when she wakes up each morning. And Archer, too. I see the spaces we’ve designed for solitude and creativity. I can even imagine my meditation cushion in front of the low window I added for my mindfulness nook. I stand in my office and see the big white oak framed perfectly by the window where I will write. I hear the clinking glasses of future dinner parties and the guitars and fiddles of music nights. I hear teenagers upstairs and their parents laughing downstairs. I see artwork in the stairwell and barn wood on walls. I feel alive and excited. The light did this. The doing did this. The living with the unknown and then knowing did this. The windows did this. This seeing out and the seeing in to the soul of the house did this. I’m a fairly frequent reader of your blog. So happy for you that the new house is shaping up and that you are figuring out how to do difficult things. I’m sending good wishes that the your building project goes smoothly and safely and that you have many inspiring moments that keep you going when the work seems too hard. Thank you for reading, Laurel. And thanks for the good wishes. I will hold that vision. We have never and may never meet, but I think of you and your family as neighbors. 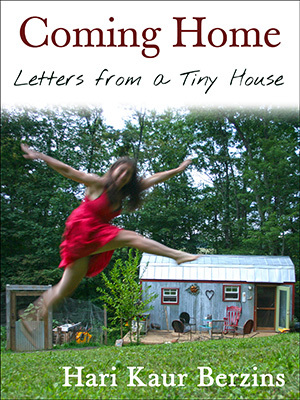 I live near Roanoke, VA and ever since my interest in tiny houses was born, I began reading your blog and following you on Facebook. Your posts are inspiring and make for a beautiful start to my day whenever there is a new one. I keep you in my daily prayers as part of the list of things God has blessed me with. Thank you for sharing your journey with the world. It is a better place with you and your family in it. God Bless & Keep you! Oh, thank you, Elisa. What a nice note. My heart grew bigger reading those words. I need you out there reading these words, you tell me they are worth writing, that they are important that they hold meaning and sometimes the weight of the world. I’d love to meet up for coffee someday. I identify with you. I have been watching, and reading your facebook page and blog for some time. I remember seeing your story on Anderson. I identified. We had lost our home the end of 2010. We lost a business. We tried moving on and in doing so, literally moved 3 times. Unsettled and always trying to figure out what to do. Well, we are now building a tiny house on wheels for our family of 4 out of 5, as one is in college. We plan on a move to a new state, a fresh start and eventually build a small cabin board by board so that we will never have another mortgage. My husband is a carpenter and a builder, so in that realm it is somewhat easier, I would assume. But, the feelings, the discovery, the learning of myself, the understanding of what this all means, I identify with. Thank you. I am thrilled to see your windows. I am thrilled to hear you are figuring it out together. 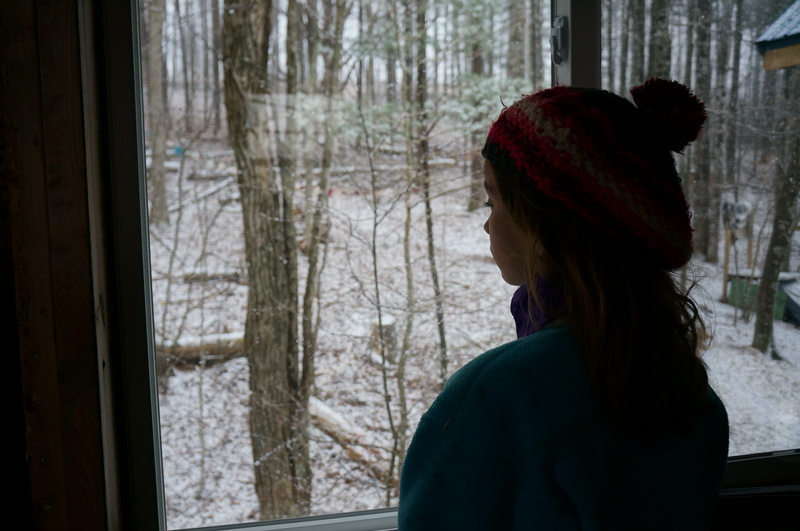 I am hopeful in seeing your kids watch. Thank you…..just thank you for sharing and opening yourself up, as I understand that is not an easy thing. God Bless you and yours and God bless the coming stages of your building process. 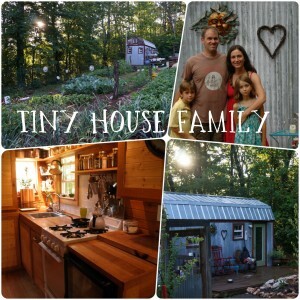 Our story is Our Tiny House View on facebook. I’m so glad to know that our story may have helped you to feel you weren’t alone. Congratulations, Wendy! I am happy you are finding your path. What an empowering journey! Good luck on and keep us posted! What an inspiration you are, Hari. You and Karl have created such a beautiful, meaningful life for your family. 🙂 Thanks, Bonnie. I can’t wait to dance through the big house! I’m SOOOO excited for ya’ll. I know the feeling and there are certain phases that really make a construction site feel more like a home and getting windows is one of those phases. Thanks, Cheri. I know you know this feeling well. Thanks for following along. We’re getting there! Cheers, mortgage-free one. Hi Hari. Estou tão feliz de ver a casa já tão adiantada. minha casa também foi feita assim, com ajuda de amigos, meu pai e meu marido. Vou te dizer: Foi uma alegria imensa quando nos mudamos. 98% da casa é feito por nós. Aqui se constrói com tijolo , cimento, concreto. Foi difícil. Eu consigo saber o que você está sentindo. Deus os leve em boa paz até o fim desse projeto. Aguardo os próximos capítulos.Lol. Here, I’ve included the google translation for Milca’s comment above: I’m so happy to see the house already so early. My house was also done well, with the help of friends, my father and my husband. I’ll tell you: It was a great joy when we moved. 98% of the house is done by us. Here is constructed with brick, cement, concrete. It was hard. I can know what you are feeling. God leads them in good peace until the end of this project. I await the next capítulos.Lol.